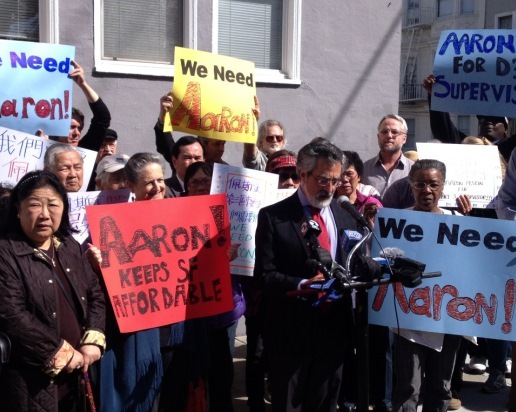 Former Board of Supervisors President and SF Democratic Party head Aaron Peskin formally announced on March 30 that he is running for D3 Supervisor. This was expected following Mayor Lee’s bypassing Chinatown tenant activist Cindy Wu in favor of Julie Christensen to fill David Chiu’s vacated seat. Peskin is already off to a fast start; he has the endorsement of five supervisors, State Senator Mark Leno, and key Chinatown activists. District 3 becomes the most contested candidate’s race on November’s ballot. Peskin’s many adversaries among real estate and development interests will spend heavily to defeat him, but they may be already underestimating his appeal to voters. I think Peskin’s candidacy is now even stronger. Here’s why. Who Will Fight Hardest for District 3? At a time when voters feel anxious about a changing San Francisco, the Peskin-Christensen race will come down to which candidate voters believe will most effectively defend D3 interests. Peskin seems more aligned with these interests. He joined David Chiu and D3 voters in opposing 8 Washington and supporting Prop G, the anti-speculation tax; Christensen was on the other side of both issues. Christensen’s past positions on tenant protections and waterfront development appear to be an obstacle to her convincing D3 voters she is on their side. I know from Peskin’s 2000 and 2004 supervisor elections that he eats, breathes and sleeps campaigning. While Christensen is sitting through long committee and Board meetings, Peskin will be out talking to voters. Peskin is good at stopping projects. But in his eight years as supervisor he backed the vast majority of development projects that came before the Board. He was also a reliable ally of the Residential Builders Association, hardly an anti-development group. Many D3 voters will strongly disagree with Ballard’s assessment that Peskin’s consistent support for tenant protections is “standing for nothing.” To the contrary, many D3 voters will vote for Peskin primarily because they know they can count on him to back pro-tenant legislation and ballot measures. Opponents will also highlight Peskin’s drunken and often abusive late night phone calls to political adversaries (and even allies, as I got one when we were friends). But Peskin’s late night outbursts are hardly news. Voters upset by such behavior probably did not vote for Peskin in the past, and will not do so in November. But if you thinking this will cost him the election, recall that he was making these calls almost from the time he took office. State Senator Mark Leno’s strong early endorsement of Peskin makes it hard to effectively portray the former supervisor as some nihilistic bomb thrower. If Leno thinks Peskin has the emotional stability and smarts to be the best candidate, opposition mailers may fail to convince voters otherwise. Julie Christensen has four things going for her in this race. First, she will have all the money she needs. Second, she has a longtime record of accomplishment in North Beach and has earned plaudits from those in the downtown community. Third, Mayor Lee will do everything in his power to elect her. Fourth, and most importantly, a projected low voter turnout would disproportionately hurt Peskin. That real estate and development interests will spend massive amounts on Christensen’s behalf is a foregone conclusion. But this avalanche of outside the district money could backfire in the D3 race. Mayor Lee’s support for Christensen is obviously critical. But the Mayor’s Chinatown tenant backers are with Peskin and the Mayor’s support for 8 Washington did not sway D3 voters on that issue. Peskin would be wise to endorse the mayor. He should also send mailings picturing the two of them and vowing to work together with Ed Lee on D3 concerns; that would diminish the impact of mailings showing the mayor with Christensen. Ultimately, Christensen’s victory likely depends most on circumstances beyond her campaign’s control: low voter turnout. Some D3 tenant voters who would favor Peskin will not vote in November. Not only are voters newer to San Francisco often not connected to local politics, but the November ballot is not shaping up as a big turnout generator. It is an off year election with an uncontested mayor’s race. There might be a ballot measure addressing short-term rentals, but that does not an excite those unconnected to San Francisco politics. Backers of a proposed housing bond will have to push turnout because it won’t get 66.7% if tenants do not vote; but whether a housing bond campaign can drive infrequent voter turnout is untested in an off year ballot. While Peskin faces the challenge of getting his majority to the polls, Christensen’s money will enable her to fund an absentee voting drive that maximizes her vote. Not only are Christensen voters more likely to be permanent absentee voters, but we have seen time and again—most recently in the Chiu-Campos race—-how better funded candidates prevail by securing huge margins among absentee voters. If anyone can figure out how to finally implement an absentee voter drive targeting infrequent voting tenants, Peskin can. And he has seven months to get it done. Randy Shaw is Editor of Beyond Chron. He spoke to Peskin last week for the first time since 2010.